Tony Jardine is an F1 Analyst and Pundit. Jardine began his career as a teacher in the USA, UK and Middle East. Tony was Head of Art at the New English School in Kuwait, where he rallied for Datsun importers in his spare time – finishing eighth on the Kuwait International Rally 1975. 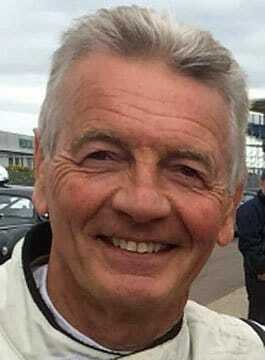 He made his transition into F1 working for Goodyear’s Grand Prix Team, driving trucks and fitting tyres at Grand Prix events before becoming a temporary engineer to teams in the pit lane. It was not long before Jardine joined the Brabham F1 Team, working alongside Niki Lauda, as race co-ordinator for all races and tests. He later moved into the drawing office with the legendary designer Gordon Murray. Tony then moved to Marlboro McLaren as Assistant Team Manager where he worked closely with Alain Prost and John Watson. Tony Jardine left F1 to work for an American promotions company in the FMCG arena. However, just 16 months later he was head hunted back into racing, but this time on the other side of the garage as a PR man overseeing the JPS brand in F1 with Lotus, working with Peter Warr, Nigel Mansell, Elio de Angelis and Ayrton Senna. Jardine’s love of rallying led him to compete in four Arctic Rally’s and ten successive Network Q Rally GB’s, finishing second in class in 2001 and winning the journalists award three times. Tony Jardine’s involvement with Motor Racing has spanned four decades ranging from truck driver, mechanic, technician, management and PR. He has been a key presenter for ITV’s coverage of the Goodwood Festival of Speed. At Sky Sports, Jardine is a studio expert on GP Masters, A1 GP and the Race of Champions. In 2010, he became a studio contributor for Sky Sports News and talkSPORT. He also provides expert analysis for BeIn Sports’ F1 coverage.